A maroon building nestled between shops on King Street East right before Jarvis Street is home to VintageSoulGeek. As the aged gold letters spelling out the shop’s name suggest, it’s a vintage boutique selling clothing, jewelry and accessories. Owned by couple Nik and Connie Bulajic, where Connie is the curator and Nik calls himself the shop boy or shop keeper. As the curator, Connie carefully picks the clothing pieces that make the store’s selection. Much of her method remains a secret, but Nik simplified it to her following trends and just knowing what people want. He calls her a huntress and trusts her intuition while he runs the other aspects of the shop. Many describe visiting the store as an experience. Although the walls are simply white, there’s an earthy undertone to the place. The pictures hanging on the wall mirror the tone of the hung clothing. The right side of the shop from the entrance is where you’ll find jewelry, broches and Nik at the counter. The left side of the store is where all the clothes are. From lavish fur coats to hats sitting on golden mannequin heads. At the very back you’ll find stunning gowns. Every component of the store comes together to contribute to a home-like feeling. “The store is just built on love and I think people can fell it when they walk in here,” explains Nik. Walking through the store is like walking through your grandmother’s closet as she narrates the story each clothing holds, but the closet is warm and it smells good. Although vintage clothes are second-hand, Nik assures they steam everything. So in truth, they smell like nothing, while the cinnamon air freshener fills your lungs as pieces grab your interest. Perhaps an earlier visit to the store would’ve felt like going through a time machine to explore fashion pieces from the 1800s to 1990s. A visit today speaks volumes to how much modern trends and fashion influences are drawn from the past. The Great Gatsby themed clothes and jewelry tags are easily recognizable by even the youngest of shoppers. The store itself is also quite young. Even though it opened up four years ago, it has many returning customers who describe VintageSoulGeek as a great place to buy gifts and shop for clothing that’s affordable. While their highly anticipated annual garage sale took place on Nov. 25 and boasted many $5 items, the store is a place where you can find unique additions to your wardrobe all year round. For almost 50 years and over three generations, Connie’s family has been vintage fashion collectors. Her grandmother started collecting pieces in the 1960s, then her mother started in the 1980’s and Connie picked up the passion in the 1990’s. However, the idea to sell some of that collection originated out of necessity. “It all came out of necessity. When Connie and I first started dating, I knew that she and her family were collecting but I didn’t understand the vastness of the collection. Once our relationship bloomed and we purchased a home together and started our family that’s when all the stuff just started coming in,” explained Nik. “She came home one particular day and she had to rent a truck to grab everything that she purchased from this place. That was before we had our business and it was like… if you want to buy more stuff, we have to start selling stuff,” explained Nik. With three bedrooms-turned closets in their home, Nik describes their entire house as a giant closet. There were more than enough clothes to fill a store. 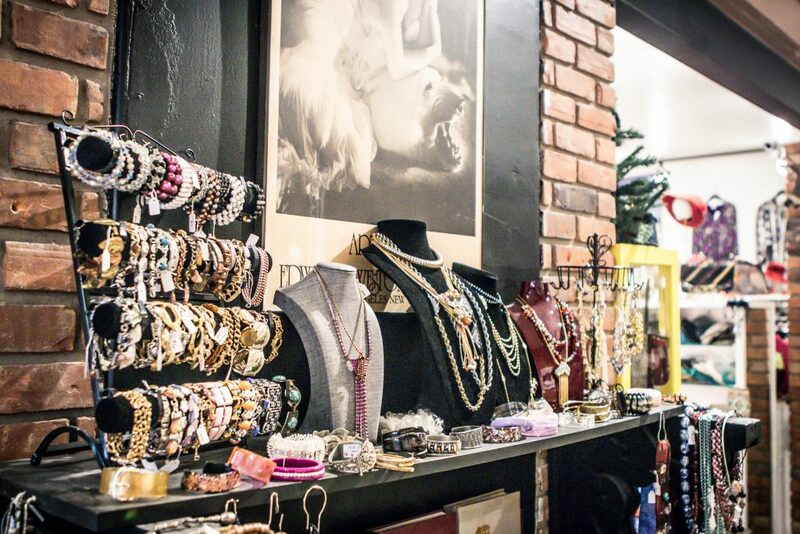 Beyond the store’s contents, there’s about a thousand pounds of jewelry. To this day, over half of the store’s contents are from the family collection. VintageSoulGeek started off with online sales before gaining exposure from vintage trade shows where they encountered their first of many instances with the film industry. Katy Holmes wore three outfits in Return to Chamelot that had pieces from their collection. Now VintageSoulGeek holds some prestige. It outfitted the cast of the Scary Stories to Tell in the Dark and the Oscar-winning movie, The Shape of Water. Pieces from the store will also appear in the upcoming Netflix movie, The Umbrella Academy. While VintageSoulGeek pieces will catch eyes on big and small screens all around the world, the little shop will always be unique to Hamilton. Beyond the vintage wardrobe, the pieces speak to decades of family history and an exciting future for the Bulajic’s business. Copyright © 2019 The Silhouette.